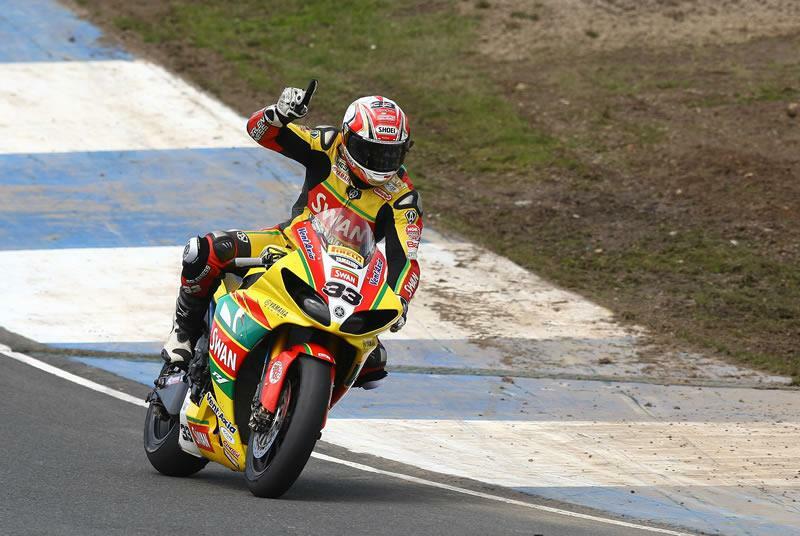 Swan Yamaha rider Tommy Hill won race two at Knockhill and in the process became the first rider this season to win both the first and second races at a round. Hill started the second race on pole but was quickly pushed into third by Shane Byrne (HM Plant Honda) and John Hopkins (Samsung Crescent Suzuki). Hopkins was suffering with problems with the rear end of his Suzuki, enabling Hill to move into second. Lap three was carnage strewn, with Tommy Bridewell, Glen Richards and Loris Baz all falling at Leslies, leading to the safety car being deployed. With racing re-starting on lap seven Hopkins was once again fighting his Suzuki, leading to the American crashing out at Leslies and his bike taking out team mate Jon Kirkham, who was able to re-join the race. Mid-way through the race, on lap fifteen, Hill pushed past Byrne on the inside at the hairpin, before Byrne reclaimed first at Leslies. Hill managed to take the lead once again, but Byrne was able to power past to lead going into lap sixteen. It was not until the twenty-first lap that Hill was able to move past Byrne, to once again take the lead, where he remained to win his second race of the day. Michael Laverty (Swan Yamaha) took advantage of Hopkins' fall to move into third position, where he maintained his pace to finish on the podium. Ryuichi Kiyonari (HM Plant Honda) was able to move past Gary Mason (MSS Colchester Kawasaki) and later Michael Rutter (Rapid Solicitors-Bathams Ducati) to take fourth, finishing ahead of Jamed Westmoreland (Motorpoint Yamaha) and Gary Mason.